During the 37th week of the year (September 10th to September 16th, 2018), at least 22 press releases were announced by companies working in Mexico, with ten informing on exploration results, six reporting on resources and developments, four communicating deals and corporate issues, and two announcing production results. ON MEXICO ISSUES, no relevant news. ON EXPLORATION, In Sonora, Riverside and Kootenay announced exploration results from its Cecilia and La Mina projects respectively. In Chihuahua, Harvest Gold began preparations to drill test its Cerro Cascaron project and Sable Resources released drilling results from its Margarita project. In Sinaloa, Auxico reported sampling results from its Zamora project In Durango, Gainey announced a 1st phase of exploration at its Las Margaritas project, Orex commenced fieldwork exploration on its San Luis del Cordero project, and Prospero reported drilling results from its Buenavista project. In Zacatecas, Advance Gold started a phase 2 drilling program at its Tabasquena project. In Jalisco, Evrim announced trench and soil results from its Cuale project. ON MINING, Starcore reported Q1 2018 results from its San Martin mine in Queretaro. US Antimony announced plans to increase its production of Sb, Au and Ag in Mexico. ON FINANCING, no relevant news. ON RESOURCES AND DEVELOPMENT, In Sonora, SilverCrest and Premier Gold released drilling results from its Las Chispas and Mercedes projects respectively. Aura provided an update at its Aranzazu mine in Zacatecas. Candelaria announced a PEA for its Pinos Gold project in Zacatecas. McEwen reported that hopes to add 12 years of mine life at its El Gallo Complex in Sinaloa. ON DEALS AND CORPORATE ISSUES, Evrim and First Majestic agreed to exercise the Ermitaño and Cumobabi option agreements in Sonora. New Gold announced the appointment of its new President and CEO (Cerro San Pedro mine, San Luis Potosi). Levon announced results from its annual general meeting (Cordero project, Chihuahua). Vangold withdrew its submission to acquire the San Carlos property in Guanajuato (El Pinguico mine, Guanajuato). Riverside Resources Inc., completed 11 N-S lines for soil sampling which returned strong multi-elements anomalies with Au, Pb, Cu, and other key elements. These results along with previous exploration work have outlined four new target areas on its Cecilia project in Sonora. Target 1 is a 4km long by 300m wide target where previous rock sampling has found up to 2 g/t Au in silicified conglomerates , but the soil anomaly is open in both directions beyond the 4 Km and more than 800m wide. Target 2 is a NE trending Ag, Pb, Au, Zn, Sb, Hg and Cu soil anomaly over 2km long and 600m wide in rock cracks with faults and host veining displaying a series of NW striking feeder dikes. Target 3 is a 1km long by 500m wide Au-Zn with minor Ag, Cu, Pb and Bi soil anomaly associated to a N-S trending fault system intersecting Paleozoic limestones. This target is also along the border edge of a magnetic high reported in a regional government geophysics survey likely associated with Pre Cambrian granitic basement. Target 4 contains “high-grade gold samples in soils and alteration with jasperoid, silicification, and carbonate veining of the Paleozoic limestone that gives a potential limestone hosted Au with anomalous soil assays of Zn, Pb, Ag and Mn”. Kootenay Silver Inc., announced that its partner Capstone Mining Corp., has commenced an exploration program on its la Mina project in Sonora. The exploration program will consists of detailed mapping and rock chip / stream sediment sampling to generate potential drill targets. Harvest Gold Corporation, reported that Evrim Resources, its JV partner and operator on its Cerro Cascaron project in Chihuahua, has mobilized an advance team to the site to start preparations to drill test the property. The drill program, expected to commence at the end of September, will consist of 3,000 m to test the Cascaron Gold targets and the Cascarita Silver targets. Sable Resources, released drilling results from its Margarita project in Chihuahua. Significant intersections are from hole M-DDH-18-09 with 6.5m of 111 g/t Ag Eq, including 3.5m of 153 g/t Ag; hole M-DDH-18-11 with 11.3m of 252 g/t Ag Eq, including 1.3m of 889 g/t Ag Eq; hole M-DDH-18-12 with 12.7m of 98 g/t Ag Eq, including 1.8m of 244 g/t Ag Eq. Additionally, Sable identified a low-grade stockwork style of mineralization evident in numerous holes. The most significant results are hole M-DDH-18-03 with 44.13m of 50 g/t Ag Eq, including 6.95m of 142 g/t Ag Eq; hole M-DDH-18-07 with 7.6m of 54 g/t Ag Eq, and hole M-DDH-18-12 with 21.35m of 37 g/t Ag Eq. “With the first stage of drilling now complete we will evaluate our results and formulate a plan for stage 2 drilling targeting further extensions of Margarita and the other adjacent parallel veins”. Auxico Resources Canada Inc., reported high-grade sampling results from its Zamora project in Sinaloa. Significant results are 0.80m of 4Kg Ag and 29.2 g/t Au at La Franca claim, 600m southwest of the Campanillas mine along a structure that can be followed by at least 600m along strike. Mineralization consists of breccia-stockwork veining containing galena, sphalerite and possible silver sulphosalts, malachite and chalcopyrite. Other significant results are from Aguamas area where some channel samples returned 0.65m of 6.38 g/t Au and 23 g/t Ag; 0.70m of 14.7 g/t Au and 34 g/t Ag; 0.50m of 3.55 g/t Au and 108.7 g/t Ag; and 1.60m of 6.64 g/t Au and 220 g/t Ag. Gainey Capital Corp., announced a phase 1 exploration program on its Las Margaritas project in Durango. Las Margaritas is a mineralized vein system that extends at least 1.5Km along strike and averages 1-2m in width. The 1st phase exploration program will consists of detailed mapping and sampling with the objective to identify prospective areas to generate the best drill targets. Orex Minerals Inc., commenced an exploration program on its San Luis del Cordero project in Durango, where the company has an option to acquire 100% interest in the property from Exploraciones del Altiplano S.A. de C.V. Mineralization at San Luis del Cordero is characterized by skarn and epithermal vein Ag-Cu-Zn as a result of Tertiary-quartz-feldspar-porphyry intrusions affecting Jurassic and Cretaceous limestones, calcareous sandstones and shales. The project has seen several phases of exploration from different mining companies, including 16,400m drilled in 62 holes in the period 2000-2016. The property contains indicated resources of 662.6K tonnes of 121 g/t Ag, 0.78 % Cu and 1.1 % Zn for a total of 5.1M Oz Ag Eq, and inferred resources of 2, 785,300 tonnes of 144 g/t Ag, 0.75 % Cu and 1.45 % Zn, for a total of 24.4 M Oz Ag Eq. Prospero Silver Corp., reported core drilling results from eleven holes totaling 2, 811m drilled at its Buenavista project in Durango. Mineralization drilled-tested at Buenavista consists of structurally controlled epithermal veins centered on a rhyolite dome complex. “All holes cut anomalous silver mineralization, with a best interval of 1.6m @ 353g/t Ag from 185.6m downhole, within a broader interval of 49m @ 43g/t Ag in hole BVF-18-05”. Advance Gold Corp., started a second phase drilling program at its Tabasquena project in Zacatecas to test the La Tabasquena epithermal vein at a depth of 1,800m. Phase 2 will test below the gold discovery hole of phase 1. It also will test some of the potential feeder type targets and all of the veins below the oxide zone which goes down to an estimated 175 metres below surface. Starcore International Mines Ltd., reported Q21 2018 results from its San Martin mine in Queretaro. Starcore milled 77,400 tonnes of 1.53 g/t Au and 49 g/t Ag to produce 3.3K Oz Au and 72.7K Oz Ag, with an all-in sustaining cost of US$ 1,215 for Eq Oz. Metallurgical recoveries were 88.1% for Au and 59.6% for Ag. US Antimony Corporation, produced 131,184 Lb Sb and 1,244 short tonnes of zeolites in August 2018 and announced plans to increase its production of Sb, Au and Ag in Mexico. At its Wadley mine in San Luis Potosi, the general level will be reactivated by cleaning up the waste to provide access and transportation of the lower grade for the mill. At Sierra Guadalupe in Zacatecas, the Santa Monica drift will be restarted. The ore is primarily sulphides and can be upgraded to 60-70% Sb flotation concentrate at its Puerto Blanco Mill to make antimony tri-sulphide. At the Soyatal district in Queretaro, a buying program will be started to purchase direct shipping ore for its Madero smelter. The construction of the cyanide leach plant for the Los Juarez Au-Ag-Sb should allow pilot testing to commence during Q4 2018. The company also closed an agreement purchase, dismantle and transport an antimony plant from Reynosa, Tamaulipas. When installed, the equipment from the Reynosa plant will increase the capacity of the Madero Smelter in Coahuila to approximately 30,000,000 Lb per year of antimony oxide. SilverCrest Metals Inc., released drilling results from its Las Chispas project in Sonora and expanded the high grade at Babicanora Norte vein. Drill holes have intersected additional high-grade Ag-Au mineralization at Babicanora Norte vein which is located about 300m NE of Babicanora vein and apparently is connected with the Granaditas area which contains multiple veins to the southeast. The most significant results are 1.8 m of 15.11 g/t Au and 1,718 g/t Ag or 2,851 g/t Ag Eq, 1.6 m of 8.96 g/t Au and 1,078 g/t Ag or 1,750 g/t Ag Eq and 1.5 m of 4.22 g/t Au and 687 g/t Ag or 1 Kg Ag Eq. The drilling results of Babicanora Norte vein will be part of the upcoming updated resource which will include 8 of the 30 identified veins in the district. Premier Gold Mines Limited, reported drilling results from the Rey de Oro deposit at its Mercedes mine in Sonora. Highlights results include hole UG-R018-013 which returned 12.64 g/t Au and 240.1 g/t Ag across 29.65 m (TW of 13.5 m), hole UG-R018-015 with 0.41 g/t Au and 3120.0 g/t Ag (91.0 oz/ton) across 1.52 m (TW of 1.06 m), and hole UG-R018-012 with 17.00 g/t Au and 321.0 g/t Ag across 1.1 m (TW of 0.8 m) and 4.47 g/t Au and 138.5 g/t Ag across 8.25 m (TW of 6.1 m). “Underground drilling at Rey de Oro consists of step-out and delineation drilling of this recently developed horizon. This drilling continues to intersect some of the widest vein intercepts on the property and demonstrate the potential to continue to extend the mine life at Mercedes”. Aura Minerals Inc., provided an update at its Aranzazu mine in Zacatecas. Aura has obtained all the necessary permits and initiated the construction of the new tailings disposal system. “The Company expects the Aranzazu mine to achieve commercial production later this year and to achieve the average processing of 2,600 tonnes per day shortly thereafter”. Candelaria Mining Corp., announced a PEA for its Pinos Gold project in Zacatecas. Highlight results from the PEA indicate an after tax net present value (NPV) of US$ 12M using a 5% discount rate, an after tax internal rate return (IRR) of 25%, and a 7 years life of mine with projected gold equivalent ounce (“GEO”) production of 89,000. The PEA includes a mineral resource estimate as of September 13, 2018. Measured resources (Dump) are 85,847 tonnes of 1.6 g/t Au and 83 g/t Ag for a total of 4,444 Oz Au and 229K Oz Ag. Indicated resources are 175,697 tonnes of 3.6 g/t Au and 47 g/t Ag for a total of 20.6K Oz Au and 268K Oz Ag. Inferred resources are 529,267 tonnes of 3.6 g/t Au and 48 g/t Ag for a total of 60.7K Oz Au and 811K Oz Ag. Average recovery for Au and Ag are 90 and 80% respectively. The company plans to have an annual production of 12,700 GEO with an overall average direct cash cost of %US 666 per GEO. McEwen Mining Inc., reported that hopes to add 12 years of mine life at its El Gallo Complex in Sinaloa, combining mineralized sources from five locations that will be developed in two distinct process plant construction phases. McEwen plans to produce 47K Oz Au Eq per year. Bacanora Lithium plc., announced plans to start the mine construction on its Sonora Lithium project in Sonora. $US 420M will be invested in the first phase and is expected to begin to operate in 2020. Evrim Resources Corp., and First Majestic Silver Corp., agreed to exercise the Ermitaño and Cumobabi option agreements in Sonora. First Majestic has completed its 100% earn-in for both projects. First Majestic has paid $1.5M in cash to Evrim and has granted a 2% NSR in the case of Ermitaño project and 1.5% NSR in the case of Cumobabi project. New Gold Inc., announced the appointment of its new President and CEO (Cerro San Pedro mine, San Luis Potosi). Levon Resources Ltd., released results from its annual general meeting (Cordero project, Chihuahua). Vangold Mining Corp., withdrew its submission to the TSX Venture Exchange to acquire the San Carlos property in Guanajuato. 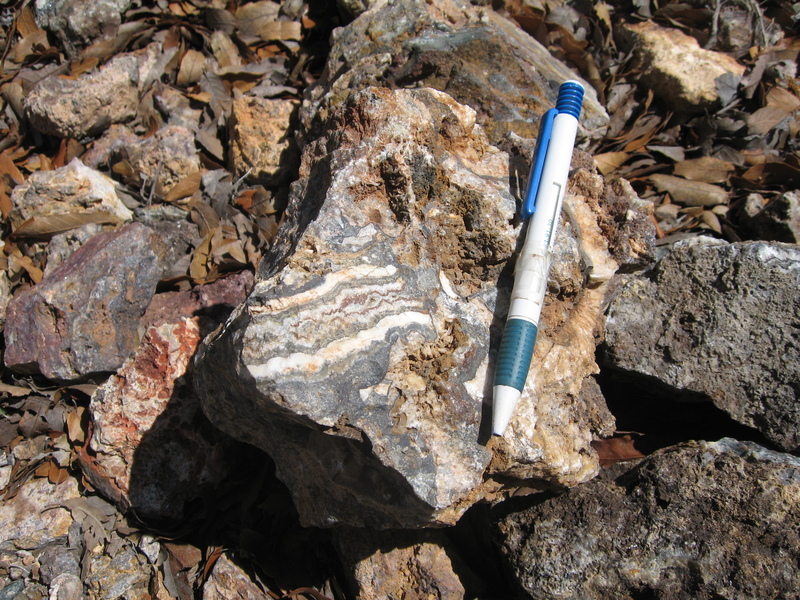 On the picture above, a banded quartz vein in an intermediate sulphidation epithermal project in Zacatecas, Mexico. Photo by Miguel A Heredia.